Kelty Journey 2.0 child backpack is a carrier especially designed for extended trips including such activities as hiking. 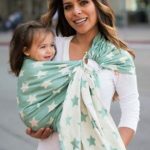 It has many different options that can make the wearing experience extra comfortable for both the parents and children. Unique patented Kelty features make this backpack very useful for long-term wearing. This carrier is considered to be one of the safest backpacks of the kind with a lot of storage space. Essentially, Kelty Journey 2.0 is a carrier and backpack in one. The carrier is rather high-priced but comes with most “bells and whisles” such backpacks can offer. While there are many advantages to this carrier, there are some disadvantages as well. In this review we are giving you all the necessary information you might need to make the right choice of a backpack carrier for your personal requirements. Kelty kids carrier can be used to carry a child and gear. The maximum load weight of the carrier is 50 lbs. Breathable mesh fabric makes this carrier suitable for long-term trips in warm temperatures. The waist band on the Kelty kids backpack carrier adjusts up and down which makes it easy to find the perfect positon for the baby during the trip. The buckles that are near the kid’s face are covered in fleece in order not to harm the baby and prevent hair tangling. The backpack is designed to take a lot of wear and tear and can endure heavy use during long walks and hikes. V-bar structure keeps the backpack from collapsing in case the parent falls on the back while hiking. The backpack attached to the back of the carrier offers a lot of useful storage space. There is no special place to store a rather large sunshade (included with the backpack). The sunshade also blocks part of the child’s view. It’s bulky and hard to deal with. When the baby falls asleep, her head rests on the aluminum bar and there is no protection from the sunshade. There are no foot rests for the baby included with the Kelty kids carrier. The price tag of this carrier is rather high. However, it has many different features included that other similar backpacks don’t offer. There is also a lifetime warranty. The manufacturer promises to fix any problems at their Colorado location (which is far from being an advantage for people from other places. Mailing this bulk backpack to other states can turn out to be quite costly). The carrier is pretty heavy. It weighs 7 lbs 20 oz. This is a lot, considering that you will need to carry a child and other accessories as well. It’s also rather bulky and will take up a lot of space in your trunk or closet. It doesn’t pack up very well. I don’t know if this is a problem with all kid carriers, but it takes up the entire trunk of my SUV. Additionally, there isn’t a good way to cinch the sunhood down if it’s not being used and it just flops around awkwardly on the pack. Patented Scherer Cinch on the waist belt allows for additional adjustability of the backpack. Besides the backpack, the carrier offers plenty of storage: space for a water bottle, zipped pocket for small accessories, special pouch for a water bottle. There is also a large zipped pocket under the seat and waist belt storage for cell phones and change. Lift handles make the carrier easy to put on when loaded and to take off after the trip. Auto-deploy kickstand deploys when the parent loosens the straps. 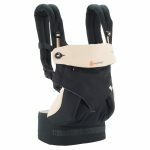 Sliding adjuster for the torso length makes it easy to adjust Kelty child carrier while wearing. Removable chin pad can be machine washed. The carrier is made out of 420D Polyester Ball Shadow and 420D Polyester oxford. The fabric is very durable and can withstand very heavy use. It’s not soft to the touch but this is not necessary for such a backpack. The buckles that can touch the child’s face are covered with fleece fabric. The frame is made out of lightweight aluminum. The manufacturer offers a lifetime warranty for the carrier. Kelty Journey 2.0 is CPSP approved and JPMA certified. The five-point harness offers the child maximum protection during hiking trips. The seat is ergonomic and allows the kid to stay in the comfortable position for the duration of any journey. Auto-deploy kickstand makes it safe to take the baby out without risking her falling when the straps are loosened. The V-bar structure is designed to keep the backpack from collapsing in case it falls. 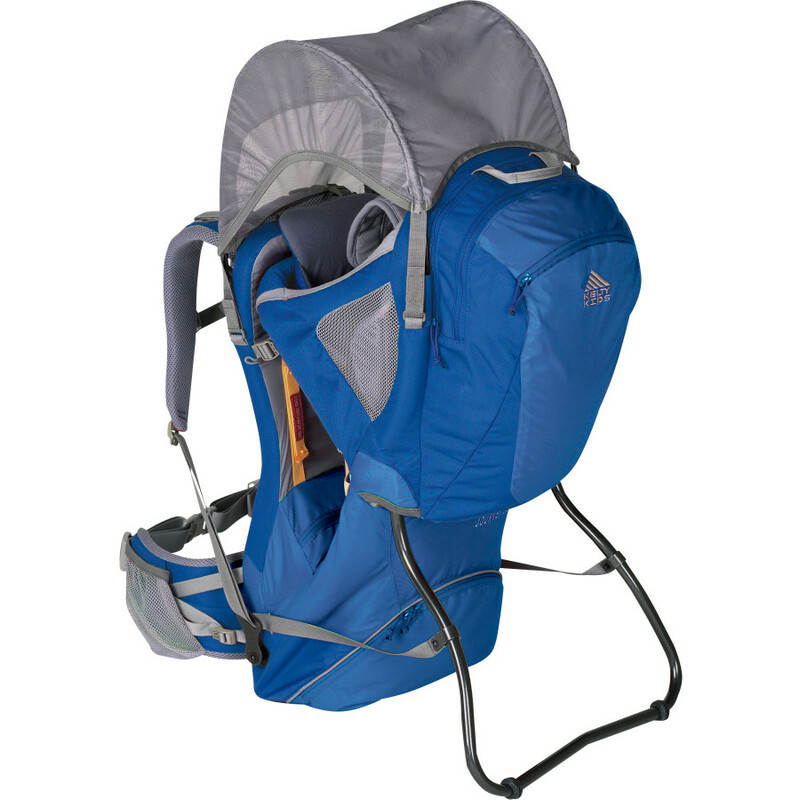 Kelty child backpack carrier is designed to offer the most comfort for the baby. The ergonomic seat, the padding and buckle protection – all make the baby comfortable during the lengthy trips. However, there are also a few disadvantages and some of them are significant. The sunshade is not designed to cover the kid’s head when she is sleeping. When the head falls on one side, it comes out of the zone covered by the sunshade. At the same time, the sunshade is large enough to obstruct part of a child’s view which can make the little explorer very upset. Considering the high price of the carrier, we would expect the manufacturer to include foot stirrups for the baby’s comfort. However, they are missing. It fits like a dream, both for the wearer and the child! Our daughter literally begs to get in it. We had some very long hikes, and she was always happy as a clam in the pack. We even wore her around the airport. She would be sitting in the airplane for hours, be tired and cranky, yet still got excited about climbing back into the Kelty carrier when we got off the plane. When adjusted correctly, you never feel the weight in your shoulders. I even walked around town for a few hours with my (at the time) 18-month old daughter in it when I was 4 months pregnant, and I didn’t feel it at all until I got home. Then, I felt like I just did a 2-hour step workout, but still no shoulder pain (my legs sure did feel that I was walking around with an extra 20-30 lbs, though!). Since Kelty child carrier is designed for outdoor activities, including long-term hiking trips, the manufacturers did their best to provide the most comfort for the parent. There is a lot of padding on the back, waist, and the shoulders. The mesh fabric is breathable and makes wearing a baby comfortable even in a hot climate. The carrier is adjustable so parents of different sizes can use it. Kelty backpack child carrier offers great weight distribution. The Scherer Cinch (patented) on the waist belt allows to do extra adjusting if the parent feels that the child is not snug enough. However, the backpack is rather heavy and can take a toll on an untrained parent’s back when the child is over 25 pounds. There are many small features that make this carrier very comfortable for the parent, including plenty of storage space and safeguards on hinges that keep the parents from accidentally pinching their fingers. My husband and I live in CO and he spent days researching/trying on various packs. This pack is AMAZING. We have only tried it around the house so far, but as soon as it dries up out here we can’t wait to hit the trails. We are both short and are carrying a 24 lb toddler. It was comfortable for us both and our little guy seems to love it so far. The sun shade is great. My only complaint is it was a little difficult to get the shade on compared to the Osprey pack we tried, but this pack was more comfortable so it is give or take. Plenty of storage and the little back pack is perfect for packing a few diapers, wipes, sunscreen, etc. Cleaning Kelty backpack kid carrier can be a bit complicated since most of the fabric can’t be removed from the aluminum carcass. This means that the carrier must be spot cleaned. The easiest way to go is to use mild soap and water mix and spot clean the backpack with a toothbrush. You can also use a damp cloth as recommended in the instructions. Bleach or liquid detergent shouldn’t be used. The polyester fabric allows for simple spot cleaning. It also dries very fast. The chin pad can be removed and machine washed to maintain proper hygiene. Kelty Journey 2.0 is specifically designed for outdoor activities. It can endure lengthy hiking trips and any is great for any “on foot” traveling plans. Both the child and the parent can feel the maximum comfort during long hikes regardless the weather. This carrier has all the accessories required to make hiking and other traveling enjoyable for parents and children. This backpack can also be used for shopping trips. Some moms even report using this carrier for doing household chores. However, it is rather bulky and heavy, so most parents prefer using lighter carriers for everyday activities. Should I Buy Kelty Journey 2.0 for my Kids? When choosing the best backpack for carrying the baby on extended trips, Kelty Journey 2.0 should definitely become one of the carriers any parent should consider. It has many different features which are absolutely necessary for long-term journeys including dangerous ones such as hiking. This carrier is designed to offer the most possible comfort for the parents and children. It has a lot of storage space and can handle weight up to 50 pounds. The aluminum frame, buckles, belts, hinges and auto-deploy kickstand make this carrier rather heavy. It weighs over 7 pounds, so parents must be ready for this additional weight when planning a trip. For the same reason, the carrier is rather bulky and takes up a lot of space. Kelty kids’ carrier offers maximum comfort fort the parent. 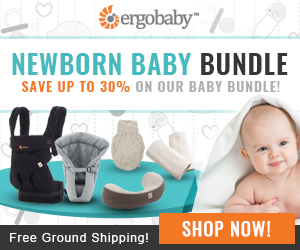 Padded straps and back panel, two-layered contoured waist belt, sliding torso-length adjuster – all these features don’t just make baby carrying easy, they offer perfect weight distribution. At the same time the little passenger gets 5-point harness, adjustable seat and a sun/rain hood for protection. The V-bar offers doesn’t allow the backpack to fold if dropped. It’s hard to say the baby’s comfort is just as well-thought-out as the parent’s. There are a few problems such as absence of foot stirrups and bad design of the sunshade which blocks the view and doesn’t offer protection when the kid is sleeping with the head on one side. The number of features that come with Kelty backpack is overwhelming. Thanks to all the bells and whistles, the price of the carrier is rather high. However, most parents find that this backpack is worth the money they spend on it. The very few cons of this backpack have to do with the child’s comfort. But they can be countered by the maximum safety the carrier offers. This backpack carrier can be used for children who weigh at least 16 pounds. This means they must be at least 5 months old. In reality this backpack will be more appreciated by children older than 9 months. 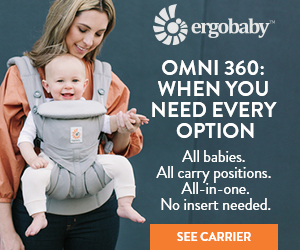 Overall, we can recommend this carrier for parents who like to spend a lot of time outdoors and go on extended trips.